Poets have always found seasonal change useful to show the cycle of life and the fleeting nature of time. Falling leaves and acorns, Margaret are you grieving, The Last Leaf and all that. 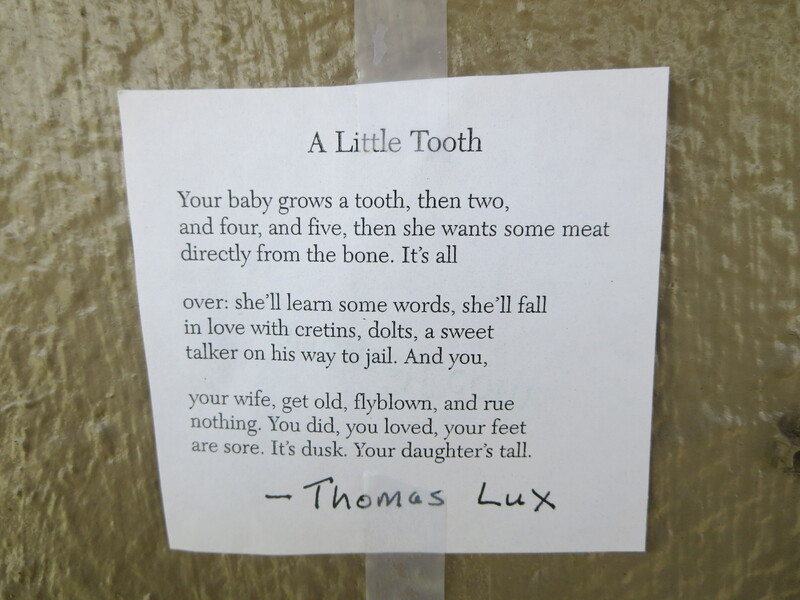 But poet Thomas Lux shows that teeth can serve as markers of time as well. After all, teeth sprout and shed. New ones replace the old. 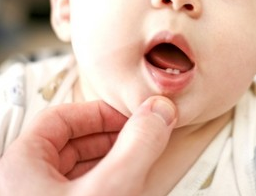 Baby teeth are even called deciduous teeth, a lovely term once common in scientific circles. The life cycle of teeth, however, is slightly-to-much more disturbing than that of an oak tree. The arrival of the first tooth may be a sweet moment for parents, but once baby uses that dear little tooth while breastfeeding, it’s all downhill. Big teeth come in, too big for the face, the beginning of the end of cuteness. Then come bills for cavities and braces, wisdom-teeth removal, root canals, bridges, capping if there’s an accident, whitening if there’s money. Teeth yellow, rot, and lengthen as we grow old, and when we die, teeth—the hardest substance in the body—outlast every other part of us, including our bones. Lux’s poem follows a similar path from sweetness to darker territory, beginning with the title. Was there ever a a title more adorable than “A Little Tooth”? The rhyme scheme, too, is as charming as a rhyme scheme can be. I don’t know if there’s a name for it, but the pattern reverses and rights itself (A, B, C, and then C, B, A, and back to A, B, C), skipping along, moving the poem through time at a clip. The poem’s structure, clever and compact, tempers its sinister side with lightness. The diction does the same. 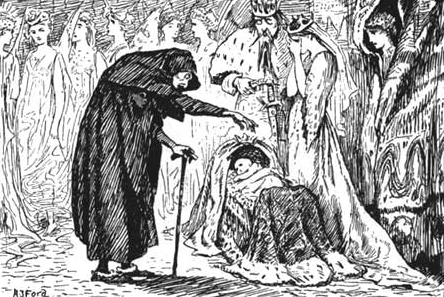 The narrator’s dire predictions remind me of the evil fairy in Grimm’s “Sleeping Beauty.” Furious at not being invited to Sleeping Beauty’s christening, she predicts that the baby will prick her finger on her fifteenth birthday and die. Like Grimm’s tale, the predictions in Lux’s poem hinge around the child’s burgeoning sexuality. The baby tooth marks the beginning of her carnal desires (meat/directly from the bone) and her eventual attraction to unsavory types (in her parents’ eyes): cretins and dolts. Fortunately, parents’ lives are separate from their children’s, or can be. The father will find himself in the Land of No Regrets. His won’t be an easy life—there’ll be hard work and experiences that leave him and his wife worn down, flyblown, as Lux puts it—but it seems a happy one, all things considered. The return to present tense from the future tense of the middle stanza lends a settled air to all the anxious ruminations over a baby tooth. Thomas Lux was born in 1946 in Massachusetts. He was the only child of parents who both held jobs that no longer exist–his mother was a telephone operator and his father was a milkman. His father worked seventeen years with hardly a day off until his son was old enough to take over the route for a week to give him time off. Neither parent graduated from high school, but Lux, a star athlete in high school, went on to graduate from Emerson College and earn his MFA from University of Iowa. Lux was the Poet in Residence at Emerson College and taught at many universities, including Sarah Lawrence, Iowa, and Michigan. He’s won a Guggenheim Fellowship and three National Endowment for the Arts grants, among other awards. Poet Thomas Lux was somebody I saw a lot those days around Cambridge, since our babies were a year apart in age. One day after I’d been doing these perfunctory prayers for a while, I asked Lux—himself off the sauce for some years—if he’d ever prayed. He was barbecuing by a swimming pool for a gaggle of poets (Allen Grossman in a three-piece suit and watch fob was there that day, God love him). The scene comes back to me with Lux poking at meat splayed on the grill while I swirled my naked son around the swimming pool. Did he actually pray? I couldn’t imagine it—Lux, that dismal sucker. Ever taciturn, Lux told me: I say thanks. For what? I wanted to know.
. . . Back in Lux’s pool, I honestly couldn’t think of anything to be grateful for. 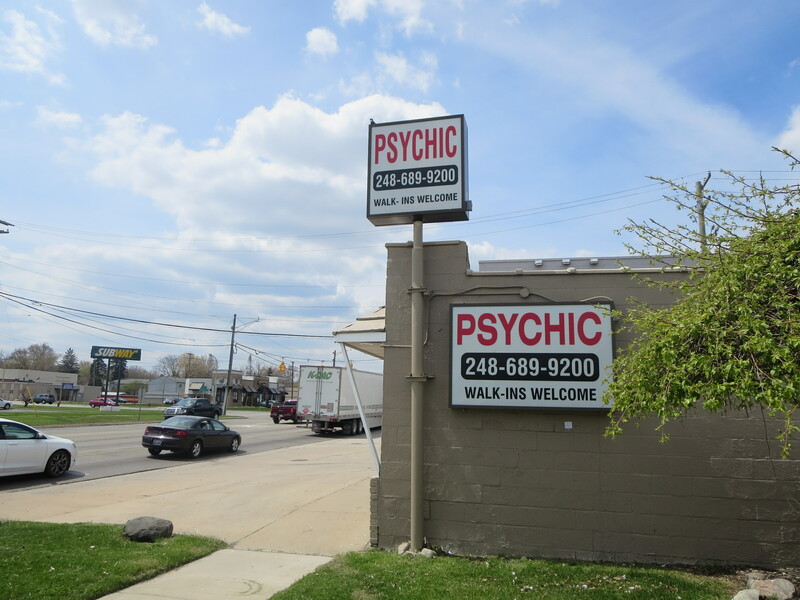 I told him something like I was glad I still had all my limbs. That’s what I mean about how my mind didn’t take in reality before I began to pray. I couldn’t register the privilege of holding my blond and ringleted boy, who chortled and bubbled and splashed on my lap. It was a clear day, and Lux was standing in his Speedo suit at the barbecue turning sausages and chicken with one of those diabolical-looking forks. Say thanks for the sky, Lux said, say it to the floorboards. This isn’t hard, Mare. At some point, I also said to him, What kind of god would permit the Holocaust? To which Lux said, You’re not in the Holocaust. In other words, what is the Holocaust my business? 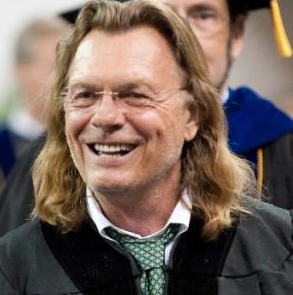 No one ever had an odder guru than the uber-ironic Thomas Lux, but I started following his advice by mouthing rote thank-you’s to the air, and, right off, I discovered something. You can read her complete essay here.